As a Hydrologist at the Oregon Water Science Center, my work is varied, encompassing river hydraulics, limnology of lakes and reservoirs, quantifying the availability of water resources, and characterizing the quality of those resources. The themes connecting all my work are the use of state-of-the-art modeling techniques tailored to each problem, and the data collection necessary to properly build and assess performance of those models. Project work accounts for 75% of my time. As a Team Lead, I facilitate a team of five Hydrologists both on my projects and to support their independent research directions. Supervisory activities account for 25% of my time. 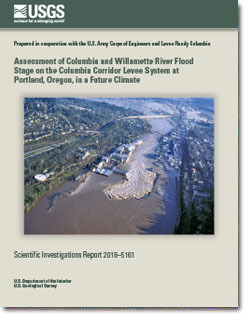 Assessment of Columbia and Willamette River Flood Stage on the Columbia Corridor Levee System at Portland, Oregon, in a Future Climate. Funded by Levee Ready Columbia. Background—Levees designed for flood protection along the Columbia River near Portland are being re-certified. Levee Ready Columbia requested an assessment of the effect of changing climate on flood stage on the levees. Approach—Delft-FM, a 2- and 3-dimensional hydrodynamic model was used to simulate Columbia River stage between Bonneville Dam and the Pacific Ocean. A methodology was developed with the US Army Corps of Engineers to scale up the boundary conditions to reflect extreme but plausible future events. Management Implications—Large rain-on-snow events in the 2040s could test the levee system in terms of its capacity to resist overtopping and seepage failure, especially if coincident with high tides and storm surge at the coast. Quantification of Instream Flow Resulting from Curtailment of Irrigation in the Sprague River Basin, OR. Funded by the US Bureau of Reclamation. Background—Enforcement of senior water rights has resulted in an unmeasured increase in instream flow, which managers want to quantify. Approach—A machine learning approach was used to simulate streamflow in the absence of irrigation curtailment. Additional instream flow resulting from curtailment was determined by comparison. Management Implications—The machine learning approach was able to quantify the additional instream flow, even though it was small in comparison to total streamflow. Importantly for managers, rigorous confidence intervals around the estimates were calculated. Model to Predict Availability of Light for Macrophyte Growth in Malheur Lake. Funded by the High Desert Partnership of Harney County, OR. Background—Invasive carp in Malheur Lake have created very turbid water by uprooting plants and leaving sediments exposed to resuspension. Approach—Continuous measurements were used to determine light as a function of turbidity. A systems model created in STELLA was used to simulate turbidity in response to wind events, to be added to a carp population model. Management Implications—Previous restoration attempts focused solely on carp removal. Totally eliminating carp will be impossible. This work has revealed new pathways to restoration by managing sediment resuspension in addition to removing carp. Deep mixing of Crater Lake in a future climate. Funded by USGS Science Support Partnership Program with U.S. National Park Service. Background—Deep mixing to the bottom of Crater Lake relies on cold winters. Such mixing replenishes nutrients at the surface and oxygen and the bottom. There is concern that a warming climate might making deep mixing less frequent. Approach—A research lake model designed to simulate mixing in very deep and cold lakes such as Lake Baikal was used in collaboration with researchers at the University of Trento. Future climate scenarios based on several general circulation models were used to simulate mixing of Crater Lake out to the year 2099. Management Implications—Deep mixing is predicted to occur less frequently in the future. Ongoing studies are examining the implications of this for water quality and water clarity. Phosphorus and Chlorophyll model of Upper Klamath Lake to Simulate response to restoration activities. Funded by US Bureau of Reclamation. Background— The Oregon Department of Environmental Quality established a total maximum daily load for phosphorus in Upper Klamath Lake as a means to control annual cyanobacteria blooms. Approach— A whole lake model that can easily be run many decades into the future was developed to assess the magnitude and time scale of the response to tributary load reduction scenarios. Management Implications—There is an understanding that improvements will take decades to be fully realized. Updates and revisions of the model to address management questions are ongoing. Wood, T.M., 2019, Use of Boosted Regression Trees to Quantify Cumulative Instream Flow Resulting from Curtailment of Irrigation in the Sprague River Basin, Oregon, USA, for submission to appropriate journal. Wherry, S.A., and Wood, T.M., 2018, A metabolism-based whole lake eutrophication model to estimate the magnitude and time scales of the effects of restoration in Upper Klamath Lake, south-central Oregon: U.S. Geological Survey Scientific Investigations Report 2018–5042, 43 p., https://doi.org/10.3133/sir20185042. 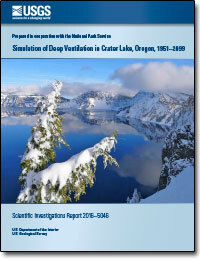 Wood, T.M., Wherry, S.A., Piccolroaz, S., and Girdner, S.F., 2016, Simulation of deep ventilation in Crater Lake, Oregon, 1951–2099: U.S. Geological Survey Scientific Investigations Report 2016–5046, 43 p., http://dx.doi.org/10.3133/sir20165046. 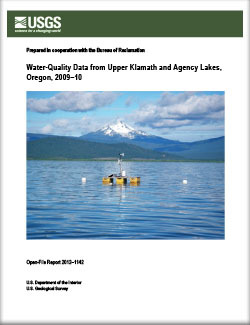 Wherry, S.A., Wood, T.M., and Anderson, C.W., 2015, Revision and proposed modification of a total maximum daily load model for Upper Klamath Lake, Oregon: U.S. Geological Survey Scientific Investigations Report 2015–5041, 55 p., http://dx.doi.org/10.3133/sir20155041. Wood, Tamara M.; Wherry, Susan A.; Simon, David C.; Markle, Douglas F., 2014, Particle-tracking investigation of the retention of sucker larvae emerging from spawning grounds in Upper Klamath Lake, Oregon; U.S. Geological Survey Open File Report 2014-1061, 45 p. https://doi.org/10.3133/ofr20141061. Wood, Tamara M.; Hendrixson, Heather A.; Markle, Douglas F.; Erdman, Charles S.; Burdick, Summer M.; Ellsworth, Craig M., 2014, Simulation and validation of larval sucker dispersal and retention through the restored Williamson River Delta and Upper Klamath Lake system, Oregon; U.S. Geological Survey Scientific Investigations Report 2013-5194, 33 p,.https://doi.org/10.3133/sir20135194. 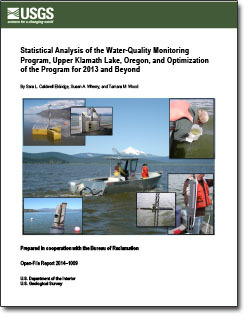 Eldridge, S.L.C., Wherry, S.A., and Wood, T.M., 2014, Statistical analysis of the water-quality monitoring program, Upper Klamath Lake, Oregon, and optimization of the program for 2013 and beyond: U.S. Geological Survey Open-File Report 2014-1009, 82 p., http://dx.doi.org/10.3133/ofr20141009. Wood, T.M., Wherry, S.A., Carter, J.L., Kuwabara, J.S., Simon, N.S., and Rounds, S.A., 2013, Technical evaluation of a total maximum daily load model for Upper Klamath and Agency Lakes, Oregon: U.S. Geological Survey Open-File Report 2013–1262, 75 p., http://dx.doi.org/10.3133/ofr20131262. Wood, T.M., Hendrixson, H. A., Markle, D. F., Erdman, C. S., Burdick, S., Ellsworth, C., Buccola, N., 2012, Dispersal of larval suckers at the Williamson River Delta, Upper Klamath Lake, Oregon, 2006-2009: U.S. Geological Survey Scientific Investigations Report 2012–5016, 28 p., http://pubs.usgs.gov/sir/2012/5016. Kuwabara, J.S., Topping, B.R., Carter, J.L., Wood, T.M., Cameron, J.M., Asbill-Case, J.R., Carlson, R.A., 2012, Changes in benthic nutrient sources within a wetland after hydrologic reconnection: Environmental Toxicology and Chemistry, v. 31, p. 1995-2013. Kuwabara, James S.; Topping, Brent R.; Carter, James L.; Wood, Tamara M.; Parchaso, Francis; Cameron, Jason M.; Asbill, Jessica R.; Carlson, Rick A.; Fend, Steven V., 2012, Time scales of change in chemical and biological parameters after engineered levee breaches adjacent to Upper Klamath and Agency Lakes, Oregon, U.S. Geological Survey Open-File Report 2012-1057, 26 p., https://doi.org/10.3133/ofr20121057. 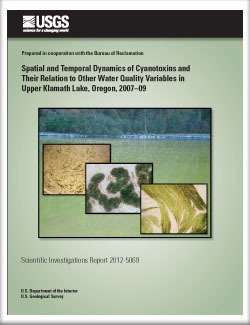 Eldridge, S.C., Wood, T.M., Echols, K.R., 2012, Spatial and temporal dynamics of cyanotoxins and their relation to other water quality variables in Upper Klamath Lake, Oregon, 2007–09: U.S. Geological Survey Scientific Investigations Report 2012–5069, 34 p., http://pubs.usgs.gov/sir/2012/5069. Wood, T.M., 2012, The effects of wind, flow, and lake elevation on transport through the Williamson River Delta, Upper Klamath Lake, Oregon: U.S. Geological Survey Scientific Investigations Report 2012–5004, 32 p., http://pubs.usgs.gov/sir/2012/5004/. Nustad, Rochelle A.; Wood, Tamara M.; Bales, Jerad D.2011, Use of a two-dimensional hydrodynamic model to evaluate extreme flooding and transport of dissolved solids through Devils Lake and Stump Lake, North Dakota, 2006, 33 p., https://doi.org/10.3133/sir20115035. Wood, T.M., and Gartner, J.W., 2010, Use of acoustic backscatter and vertical velocity to estimate concentration and dynamics of suspended solids in Upper Klamath Lake, south-central Oregon: Implications for Aphanizomenon flos-aquae: U.S. Geological Survey Scientific Investigations Report 2010–5203, 20 p., http://pubs.usgs.gov/sir/2010/5203. Buccola, N.L., and Wood, T.M., 2010, Empirical models of wind conditions on Upper Klamath Lake, Oregon: U.S. Geological Survey Scientific-Investigations Report 2010–5201, 26 p., http://pubs.usgs.gov/sir/2010/5201. VanderKooi, S.P., Burdick, S.M., Echols, K.R., Ottinger, C.A., Rosen, B.H., and Wood, T.M., 2010, Algal toxins in Upper Klamath Lake, Oregon: Linking water quality to juvenile sucker health: U.S. Geological Survey Fact Sheet 2009-3111, 2 p., http://pubs.usgs.gov/fs/2009/3111. Wood, T.M., 2009, Preliminary study of the effect of the Long Lake Valley Project operation on the transport of larval suckers in Upper Klamath Lake, Oregon: U.S. Geological Survey Open-File Report 2009-1060, 24 p., http://pubs.usgs.gov/of/2009/1060. Lindenberg, M.K., and Wood, T.M., 2009, Water quality of a drained wetland, Caledonia Marsh on Upper Klamath Lake, Oregon, after flooding in 2006: U.S. Geological Survey Scientific Investigations Report 2009–5025, 24 p., http://pubs.usgs.gov/sir/2009/5025. Wood, T.M., Cheng, R.T., Gartner, J.W., Hoilman, G.R., Lindenberg, M.K., and Wellman, R.E., 2008, Modeling hydrodynamics and heat transport in Upper Klamath Lake, Oregon, and implications for water quality: U.S. Geological Survey Scientific Investigations Report 2008–5076, 48 p., http://pubs.usgs.gov/sir/2008/5076. Kuwabara, J.S., Lynch, D.D., Topping, B.R. Murphy, Fred, Carter, J.L., Simon, N.S., Parchaso, Francis, Wood, T.M., Lindenberg, M.K., Wiese, Katryn, Avanzino, R.J., 2007, Quantifying the Benthic Source of Nutrients to the Water Column of Upper Klamath Lake, Oregon: U.S. Geological Survey Open File Report 2007-1276, 39 p., http://pubs.usgs.gov/of/2007/1276. Gartner, J.W., Wellman, R.E., Wood, T.M., and Cheng, R.T., 2007, Water velocity and suspended solids measurements by in-situ instruments in Upper Klamath Lake, Oregon: U.S. Geological Survey Open-File Report 2007-1279, viii+137 p., http://pubs.usgs.gov/of/2007/1279. Wood, T. M. and R. T. Cheng, 2006, “Use of UnTRIM to investigate dissolved oxygen transport in Upper Klamath Lake, Oregon.” Proceedings of the 7th Int. Conf. on Hydroscience and Engineering, Sept. 10-13, 2006, Philadelphia, USA. Wood, T.M., Hoilman, G.R., and Lindenberg, M.K., 2006, Water-quality conditions in Upper Klamath Lake, Oregon, 2002-04: U.S. Geological Survey Scientific Investigations Report 2006-5209, 52 p.
Cheng, R., Gartner, J. and Wood, T., 2005, “Modeling and Validation of Wind-Driven Circulation in Upper Klamath Lake, Oregon”. Proceedings of the 2005 World Water and Environmental Resources Congress, R. Walton (editor), EWRI/ASCE, May 15-19, 2005, Anchorage, Alaska. Fisher, L.H., Wood, T.M., 2004, Effect of water-column pH on sediment-phosphorus release rates in Upper Klamath Lake, Oregon, 2001: U.S. Geological Survey Water-Resources Investigations Report 03-4271, 25 p.
Wood, T.M., 2001, Sediment Oxygen Demand in Upper Klamath and Agency Lakes, Oregon, 1999: USGS Water-Resources Investigations Report 01-4080, 13 p.
Wood, T.M., 2001, Herbicide Use in the Management of Roadside Vegetation, Western Oregon, 1999-2000: Effects on the Water Quality of Nearby Streams: USGS Water-Resources Investigations Report 01-4065, 27 p.
Rounds, S.A. and Wood, T.M., 2001, Modeling water quality in the Tualatin River, Oregon, 1991-1997: USGS Water-Resources Investigations Report 01-4041, 53 p.
Tanner, D. Q. and Wood, T.M., 2000, The Effect of Calcium Magnesium Acetate (CMA) Deicing Material on the Water Quality of Bear Creek, Clackamas County, Oregon, 1999: USGS Water-Resources Investigations Report 00-4092. Rounds, S.A., T.M. Wood and D.D. Lynch, 1999, Modeling discharge, heat flow and water quality in the Tualatin River, OR, USGS Water Supply Paper 2465-B, 121 p.
Rounds, S.A. and Wood, T.M., 1998, Using CE-QUAL-W2 to assess the ammonia assimilative capacity of the Tualatin River, Oregon, in Proceedings of the First Federal Interagency Hydrologic Modeling Conference, Las Vegas, Nevada, April 19-23, 1998: USGS, p. 2-133 – 2-140. Wood, T.M. and Rounds, S.A., 1998, Using CE-QUAL-W2 to assess the effect of reduced phosphorus loads on chlorophyll a and dissolved oxygen in the Tualatin River, Oregon, in Proceedings of the First Federal Interagency Hydrologic Modeling Conference, Las Vegas, Nevada, April 19-23, 1998: USGS, p. 2-149 – 2-156. Anderson, C.A., Wood, T.M., and Morace, J.L., 1997, Distribution of dissolved pesticides and other water quality constituents in small streams, and their relation to land use, in the Willamette River Basin, Oregon, 1996, USGS Water-Resources Investigations Report 97-4268, 87 p.
Wood, T.M., Fuhrer, G.J., and Morace, J.L., 1996, Relation between selected water-quality variables and lake level in Upper Klamath and Agency Lakes, Oregon: USGS Water-Resources Investigations Report 96-4079. Wood, T.M., A.M. Baptista, J.S. Kuwabara and A.R. Flegal, 1995, Diagnostic modeling of trace metal partitioning in south San Francisco Bay, Limnology and Oceanography, vol. 40, no. 2, pp. 345-358. Wood, T.M. and A.M. Baptista, 1993, A model for diagnostic analysis of estuarine geochemistry, Water Resources Research, vol. 29, no. 1, pp. 51-71. Gutzler, D.S. and T.M. Wood, 1990, Structure of large-scale convective anomalies over tropical oceans, Journal of Climate, vol. 3, no. 4, pp. 483-496. Rosen, R.D., D.A. Salstein and T.M. Wood, 1991, Zonal contributions to global momentum variations in intraseasonal through interannual time scales, Journal of Geophysical Research, vol. 96(D3), pp. 5145-5151. Rosen, R.D., D.A. Salstein and T.M. Wood, 1988, Discrepancies in the earth-atmosphere angular momentum budget, Journal of Geophysical Research, vol. 95(B1), pp. 265-279. USGS research directly helps local public agencies that are responsible for the design and maintenance of the levees that surround the northern Portland metropolitan area with the goal of protecting life and property in the event of flooding from the Columbia and Willamette Rivers that surround the city. 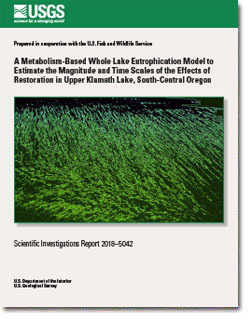 Wherry, Susan A.; Wood, Tamara M.
Wherry, S.A., and Wood, T.M., 2018, A metabolism-based whole lake eutrophication model to estimate the magnitude and time scales of the effects of restoration in Upper Klamath Lake, south-central Oregon: U.S. Geological Survey Scientific Investigations Report 2018–5042, 43 p., https:/doi.org/10.3133/sir20185042. Eldridge, Sara L. Caldwell; Wherry, Susan A.; Wood, Tamara M.
Statistical analysis of the water-quality monitoring program, Upper Klamath Lake, Oregon, and optimization of the program for 2013 and beyond; 2014; OFR; 2014-1009; Eldridge, Sara L. Caldwell; Wherry, Susan A.; Wood, Tamara M.
Wood, Tamara M.; Wherry, Susan A.; Simon, David C.; Markle, Douglas F.
Particle-tracking investigation of the retention of sucker larvae emerging from spawning grounds in Upper Klamath Lake, Oregon; 2014; OFR; 2014-1061; Wood, Tamara M.; Wherry, Susan A.; Simon, David C.; Markle, Douglas F.
Wood, Tamara M.; Wherry, Susan A.; Carter, James L.; Kuwabara, James S.; Simon, Nancy S.; Rounds, Stewart A. Technical evaluation of a total maximum daily load model for Upper Klamath and Agency Lakes, Oregon; 2013; OFR; 2013-1262; Wood, Tamara M.; Wherry, Susan A.; Carter, James L.; Kuwabara, James S.; Simon, Nancy S.; Rounds, Stewart A.
Evenson, Eric J.; Orndorff, Randall C.; Blome, Charles D.; Böhlke, John Karl; Hershberger, Paul K.; Langenheim, V.E. ; McCabe, Gregory J.; Morlock, Scott E.; Reeves, Howard W.; Verdin, James P.; Weyers, Holly S.; Wood, Tamara M.
U.S. Geological Survey Water science strategy--observing, understanding, predicting, and delivering water science to the nation; 2013; CIR; 1383-G; Evenson, Eric J.; Orndorff, Randall C.; Blome, Charles D.; Böhlke, John Karl; Hershberger, Paul K.; Langenheim, Victoria E.; McCabe, Gregory J.; Morlock, Scott E.; Reeves, Howard W.; Verdin, James P.; Weyers, Holly S.; Wood, Tamara M.
Eldridge, Sara L. Caldwell; Wood, Tamara M.; Echols, Kathy R.
Spatial and temporal dynamics of cyanotoxins and their relation to other water quality variables in Upper Klamath Lake, Oregon, 2007–09; 2012; SIR; 2012-5069; Eldridge, Sara L. Caldwell; Wood, Tamara M.; Echols, Kathy R.